Welcome to the happy mountain town of Biala Mountain - temperatures here are below zero all year round so be sure to wear warm clothes! If you visit during the Christmas season, you'll find it packed with tourists who travel from all over Marada for the special events hosted here, but there's always plenty to do in the rest of the year as well. Grab yourself an ice-cream to eat as you watch the newth races, and don't forget to pick up a few tickets for the monthly maradan lottery - it could be you who wins this month! Visit during the month of December for a free prize each day. Complete the Advent Tree Instructions and receive new prizes every December. Complete the 30 levels of Blitzen's mission for a limited Viotto pet. Do whatever you like to the Christmas Tree and hope for a prize. Try and restock some rare pet costumes in this shop for your pet to wear. Buy frozen food items you need in this shop. Play the free Fruit Machine game and maybe win a prize. Complete levels of goals related to this world and win prizes. Use and collect each Giftbox to unlock new features and benefits in Marada. Complete the Christmas Treasure Map for lifetime access to the Ice Caves. Buy ice cream items from this shop. 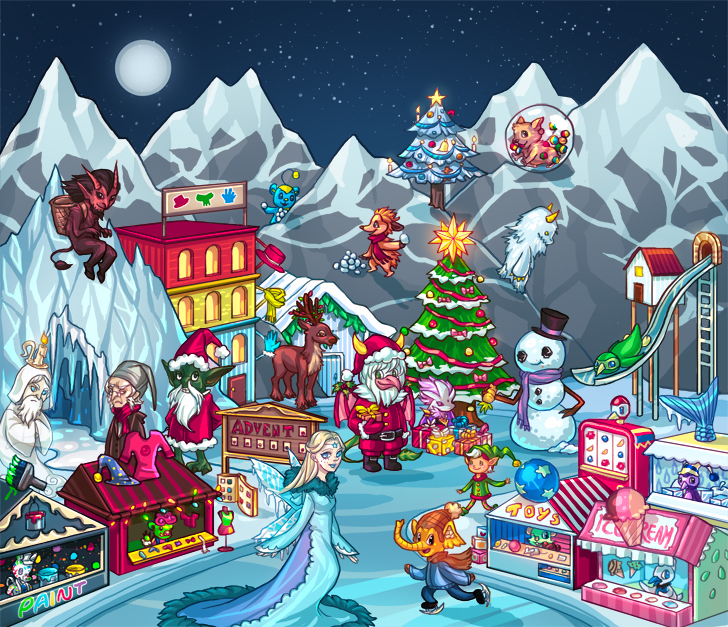 Play the Ice Fairy's mystery item game daily for a chance to win. Have you been naughty or nice this year? Visit in December to find out. Buy your lottery tickets for a chance to win the weekly lotto jackpot. Wage a bet on your favourite Newth to win MP. Bring Santa Claws the items he asks for and get rewarded. Take part in his Raffle every Elfember. Scrooge donates items randomly to the Pot of Gold every day of the year for you to grab for free. The Seasonal Fairy rewards you for the number of Giftboxes you have collected. Send out the Secret Santa's items for a nice reward. Send out the Snowman's Christmas presents for a nice reward. Collect your stamp items and place them into your Stamp Album. Buy toys for your pet to play with in this shop.